Aside from what I wrote for Owning Pink, this is my first blog post after returning from our trip to visit family. After three years we finally made it back up to Maryland to see my mother-in-law. I have to admit I resisted the trip with everything in me. As much as I wanted the girls to spend time with Grandma, it came down to me just NOT wanting to drive up there. Three years ago we flew, but this time that just wasn’t in the cards. In May, after a lot of “flip-flopping” I made the final decision that we were NOT going to go. I told Mark it was my decision and I would call his mother to inform her. I knew she was going to be upset but I rationalized it all. (There were a few more issues a long with the drive.) Before I made the call I meditated and got very peaceful. I set the intention to be open and loving and for our conversation to go smoothly. It turned out to be one of the best conversations we’ve had in years. We talked for an hour and a half and when I hung up the phone, I told her we couldn’t visit in August but we’d try our best to visit. I listened to her with an open heart and she changed my mind. Once we found out she wasn’t working in June we began to plan our trip. We left on Wed. the 23rd at 4:15am and arrived at her house at 8:15pm. We traveled with the girls and our two mini dachshunds and amazingly enough there were no problems at all. I never imagined the drive could possibly be that peaceful, but it was. The trip was great. 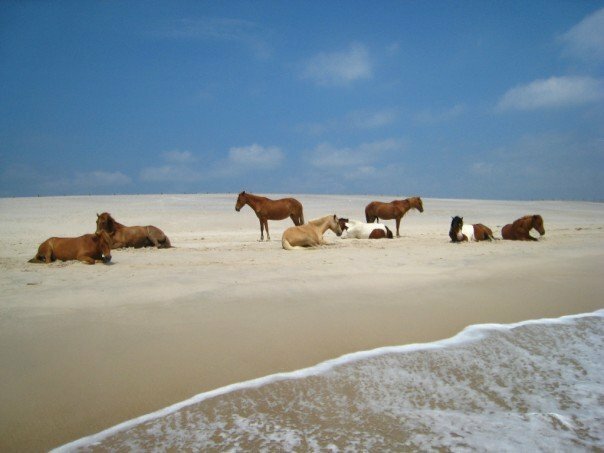 We went to Assateague Island one day. The waves were rough and cold, but once I got used to it I tried out the boogie board. To my surprise I was pretty good at it and as we were packing up a woman approached me and said she and her family had voted me “best wave rider” of the day. Another day we went to the nearest zoo, which will be a whole other not-so-cheery blog post. The girls reveled in their time with grandma and I did some reading and relaxing. On the way back home we stopped in NC and stayed at my parents’ house for one night. My sisters, one brother-in-law, and nieces were all there to greet us. We had a wonderful few hours of catching up before going to sleep and waking early to hit the road once more. We made it home in the evening of the 29th. Thank you guys for sticking around while I was away. I hope “fiction week” was entertaining enough. I’ve got a few post ideas brewing, so hopefully I will get them out over these next two weeks!